Experts conducting site based vulnerability assessments agreed that most schools are unprepared to respond and react to most emergency situations with any degree of desired proficiency. We have developed a customized solution to address these issues and to empower educators and youth-serving professionals to successfully respond and react to emergency situations. The CRK is intended be placed throughout each facility in key locations such as: Main Office, Guidance Department, Chemistry/Science/Laboratories, Athletic Department, Maintenance Department and individual classrooms. 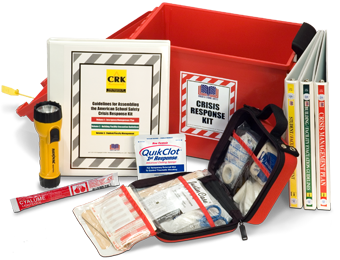 A duplicate copy of the Crisis Response Kit should also be kept off-site; preferably at the Superintendent’s Office, Police Department, Fire Department, or Town Office of Emergency Management. The CRK fills a crucial void in basic educator certification training, while facilitating collaboration between personnel who otherwise rarely meet to plan policies, procedures and guidelines for crisis response. Further, it provides a myriad of resource personnel to bolster areas where local first responders may lack expertise, e.g., essential hardware, legal implications, Gestalt security thinking, etc. And for those who worry about the cost of implementing such a comprehensive program, each kit costs less than $1 per child in most schools. Comprehensive, easy to use, 115 page volume with indexes, color coded tabs, and incident divider sections. A complete, up to date, copy of the Crisis Management Plan, tabulated by cataloged items including checklists for handling common emergency events such as bomb threats, fires, lockdowns, weather related events, etc..
Aerial maps and campus diagrams of all buildings; multiple copies of simplified building and floor plans showing evacuation routes, assembly areas, designated receiving areas for parents, etc. List of Staff (students, teachers, etc.) names, addresses, and contact details, including known medical conditions of students and staff and the availability of medications during a lockdown or extended shelter-in-place event, etc. 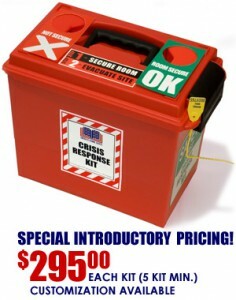 First Aid Kit (20 person) 100 items. QuikClot® (stops severe, life threatening bleeding). Latex Gloves, 2 pair, Barrier Protection. Cyalume Light Stick, 6”, 12 hour duration. Emergency Flashlight (shake to activate). American School Safety CDROM containing The Security Evaluation & Planning Guide©, Education Security & Safety Planning: 4 Steps to Successful Implementation© PowerPoint® Presentation. 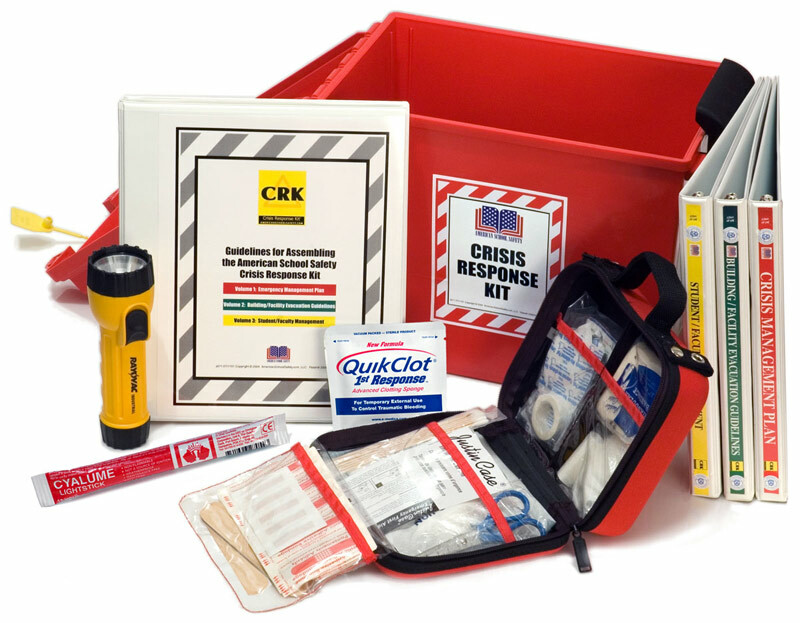 High Visibility Decals (Crisis Response Kit; Light Source Symbol; First Aid Symbol; Safety First). Highly Reflective Room Status Placards. PLEASE NOTE: School/District customization is available. Educational tool for teachers, administration and staff for familiarization of on-site security, safety, and emergency management plans, protocols and procedures. Registration tag for updating, auditing and inspection by governing agencies. Contains timely critical site-based information insuring its availability to first responders in the event of an emergency. Website updates and informational bulletins for refreshing best practices information. Access to nationally known, licensed security and audit professionals. Click here to contact us online or call 866-531-6560 for additional information.